This is the Hudy Exclusive Edition Large Transmitter Bag. With your transmitter being one of the single most important pieces of your racing equipment, it deserves all the protection it can get when traveling to and from races. To keep your transmitter safe and protected, use the stylish HUDY Exclusive Transmitter Bag. Well padded to withstand the rigors of travel and with a spacious interior, the transmitter bag safely protects even the full-size computer radios available on the market today. With most racers carrying two transmitters to a race the HUDY Transmitter Bag is spacious enough to comfortably store two transmitters. To prevent the transmitters form moving during transport, an elastic safety strap inside the bag securely holds the transmitters. Large dual zippers make access quick and easy. Strong lightweight nylon gives durability, and tough heavy-duty stitching is used throughout the bag’s construction. A wide, rubber-coated handle strap makes carrying super easy and comfortable. The clear-plastic pocket allows you to display an ID card so you can quickly identify your transmitter bag. Two exterior straps at the rear of the bag allow you to mount the transmitter bag to most widely-used car carrying bags. A special wide elastic strap (also on the exterior) lets you attach the transmitter bag to your hand luggage when traveling. Manufactured in Europe from premium European high-quality materials, everything on this bag is premium. Highest-quality materials combined with expert workmanship ensure the durability, performance, and long life of this bag. 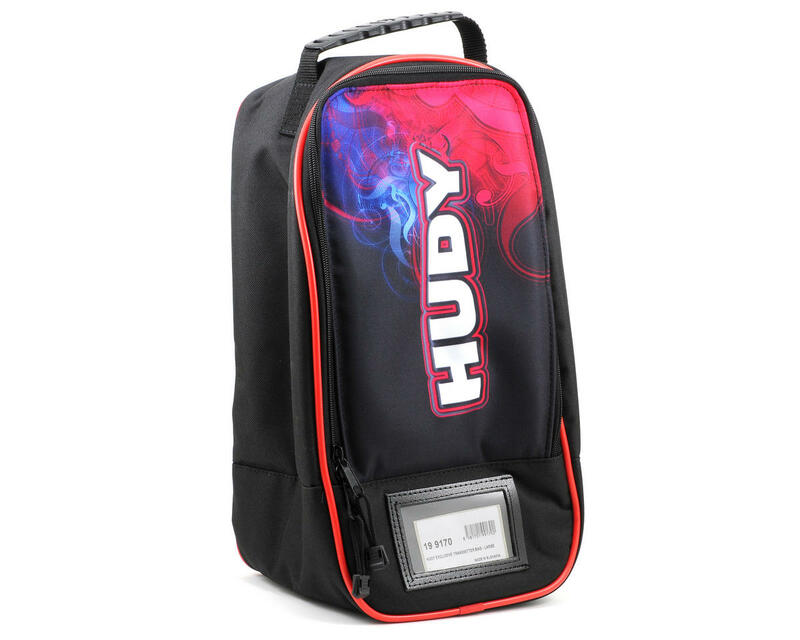 For a unique and stylish look to separate yourself from the crowd, the HUDY Exclusive Transmitter Bag features full-colored stylish HUDY graphics emblazoned on the bag exterior.